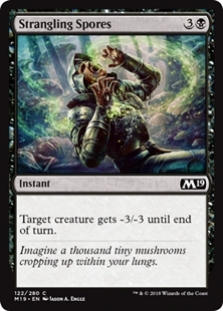 I wanted to do some Limited content and had the idea not only to show you five packs and discuss what I would first pick, but also take a look at more picks down the line. 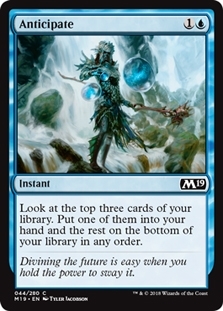 Often it's not the first pick that is the most interesting (take the best card), but rather your 2nd-5th pick as you have to evaluate your picks about what you already have, and you are not yet locked into a color combination. So imagine we have five players lined up beside each other in a draft! I thought that doing the full eight would be overwhelming, but you can play along at home and extend this yourself! We will take a look at Player 1's first pick. Then we move on to Player 2's first pick and see what Player 1 would pick up after getting passed the remaining cards. All clear? It'll make sense once we begin, trust me! Whew, so many options here! I have no idea how to evaluate Sai. 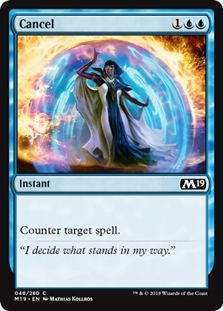 On the one hand, it could be a great early pick since you can draft around it. On the other hand, at that point, you are just forcing. I haven't had success with that strategy so far, so I'd just leave it. 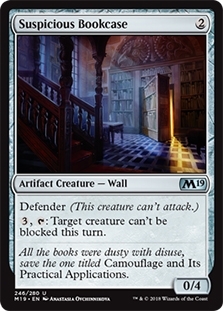 Both multicolor cards are powerful, but none of them are important pillars of their archetype. 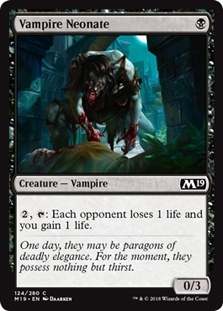 cards like Heroic Reinforcements and Regal Bloodlord are in good archetypes and are bomb-level powerful when the deck comes out right. These cards I'm happy to first pick and see if their color combination is open. 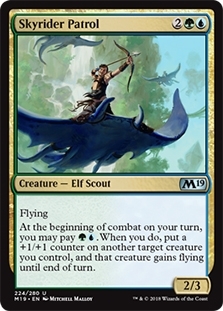 These blue fliers, however, I wouldn't pick over the best commons. I think there is a reasonable argument for Bone to Ash. I have yet to figure out if it's better than Essence Scatter. 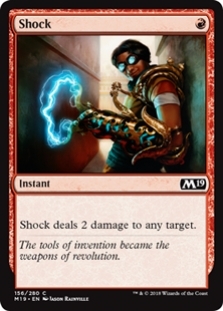 Shock also comes close. 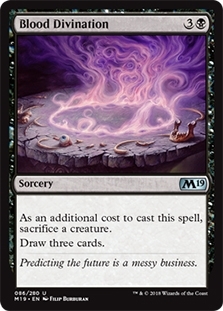 It's not stellar in this format, as there are so many things with three toughness and the small stuff doesn't necessarily matter. But it rarely doesn't have a target and can be a be a brutal tempo swing when combined with a good curve, so I'd pick it up here, but it's extremely close. 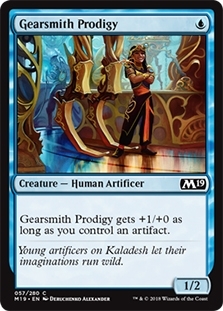 Prodigious Growth is a very powerful rare. 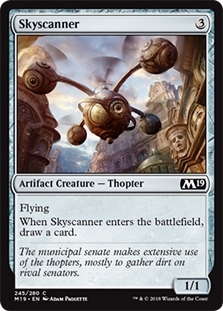 Essentially a 7/7 trample and haste for six mana. 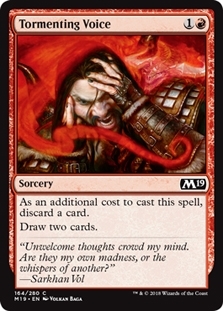 You can even enchant a useless 2-drop so that you barely get two-for-oned by a removal spell. 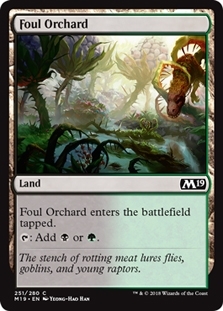 And Bolas forbid you to get this on a Vine Mare. But Murder is Murder. 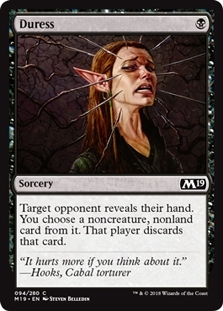 It's the best removal spell in the format, and we pick it over everything except the best rares. And so will Player 2. 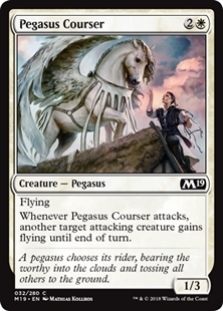 This makes Player 1's decision easy, as Prodigious Growth as far and wide the best card remaining in the pack. I opened this whammy of a pack in an online draft, and I must say it was a tough choice. Rarely do you get both a regular rare and a foil rare in the same pack. 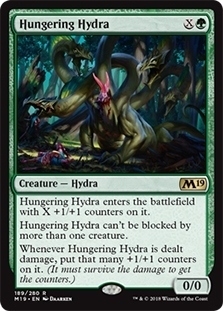 I think Hungering Hydra is the worse of the two. Its initial body is going to subpar. 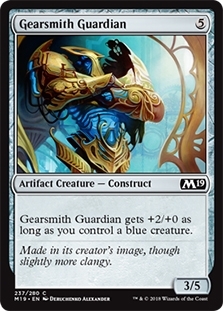 Five mana 4/4. 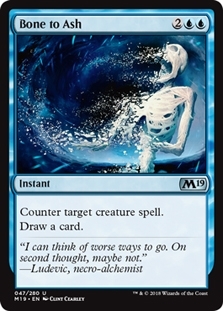 Seven mana 6/6. 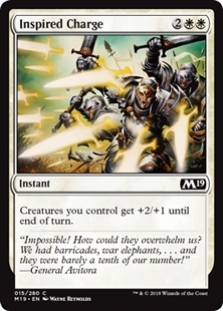 But it does snowball and is probably better than Colossal Dreadmaw. 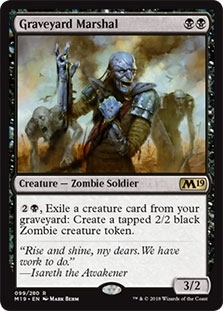 Graveyard Marshal, however, is both a sizeable early play and a great mana sink topdeck in the late game as it starts churning out Zombies from your graveyard. 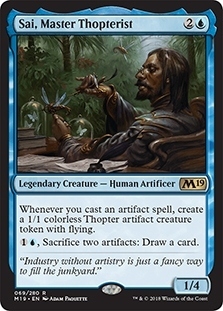 But here we also have one of the premium uncommons. 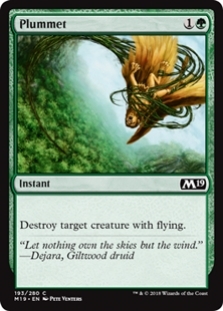 Dryad Greenseeker comes down early and starts drawing 40 % of a card each turn while still being a reasonable blocker. 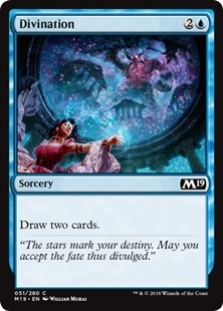 When you need lands, activate after your draw step. When you need to draw gas, activate it in your upkeep. 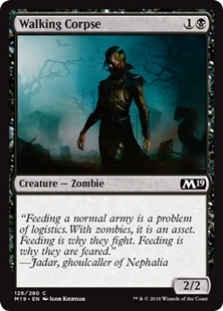 This is another card on nearly the same tier as Murder, and so I'd pick it over Graveyard Marshall. But if you have a slightly different color preference, I wouldn't fault you for doing otherwise. This also means that Player 2 with their Murder has a very Graveyard Marshall to snag up. And Player 1 decision is not any bit harder. When you get passed giant green rares, you keep taking them! Another interesting pick. 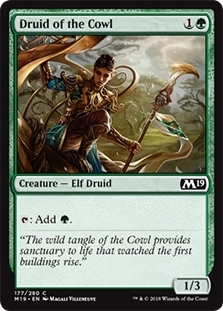 Star-Crowned Stag, Druid of the Cowl and Strangling Spores are all within the top 2 of cards in their color. 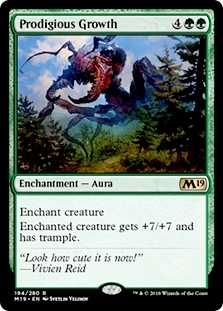 But then we have this weird rare. 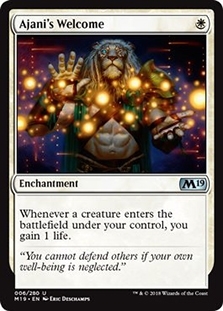 In the right deck - that is, a controlling deck with plenty of 3-toughness creatures to not care about a 2/4 - this card can be close to a triple removal spell. 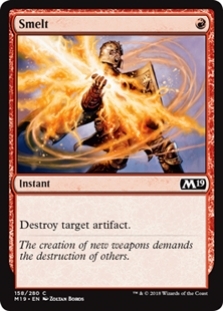 You can also use it on your creatures that have gotten hit by Luminous Bonds, or to upgrade your Elvish Rejuvenator into a real blocker. 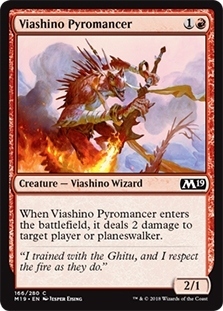 The card will be unplayable in a red-white aggro strategy, but whenever your deck is slower, it can be quite powerful. On top of that, it's also colorless, so it doesn't matter which slow color combination you put it in. 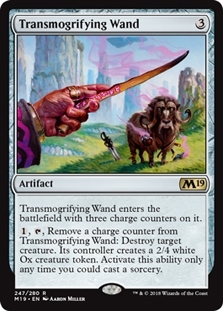 Because of all this versatility, and we don't have any premium commons or uncommons (such as Luminous Bonds and Lich's Caress or similar power level cards), I believe Transmogrifying Wand is the first pick here for Player 4. 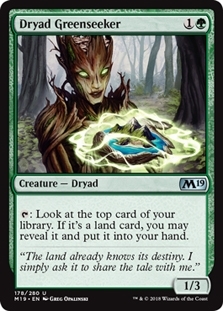 Player 3 would be happy to receive a Druid of the Cowl to complement their Dryad Greenseeker. 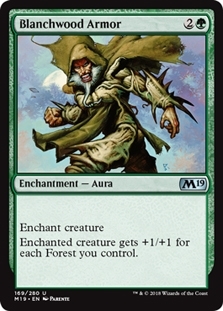 Druid of the Cowl is on about the same power level as the other good commons in this pack, so it makes sense to stick to your color. The same holds true for Player 2 who get to stick to black with a Strangling Spores. It's a little bit more difficult for Player 1. 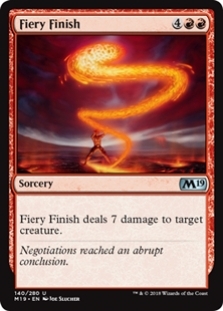 At this point, the best red or green card left in the pack is Fiery Finish, but they already have two expensive cards and starting out your draft with too much high-end is not a good place to be. 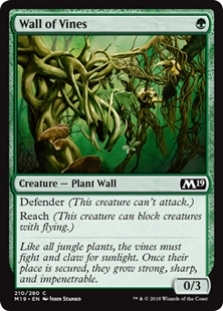 Red-Green is often a ramp deck. 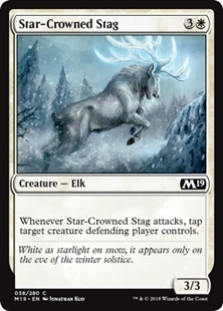 I think you pick up the best common left over here, Star-Crowned Stag, and see if this means that white is open. 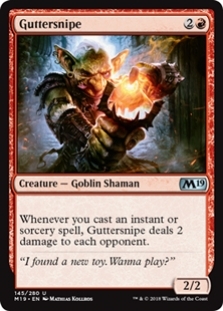 If not, continue to pick red and green cards, but at this point Player 1 has little incentive to be red outside of a not-stellar first pick. This is such a weak pack! 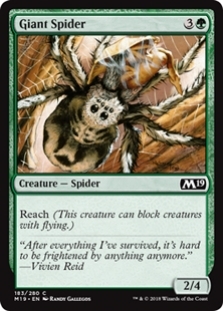 Nono of the top 2 commons in each color, no exciting uncommons, and another weird rare. 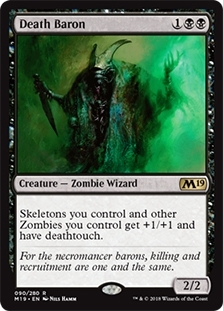 Death Baron I do like, as there are a lot of Zombies and Skeletons in black, even at common. 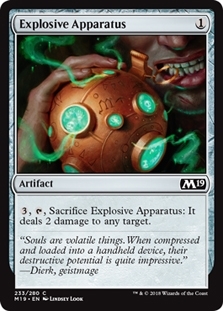 If it only gave the +1/+1 bonus, I wouldn't be excited by it except in the most creep-heavy decks. But granting deathtouch on top of that is what bakes the cake for me. 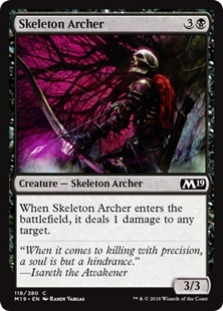 Now you're Walking Corpses are very real Magic-cards, plus you sometimes get to set up the combo with Skeletal Archer. 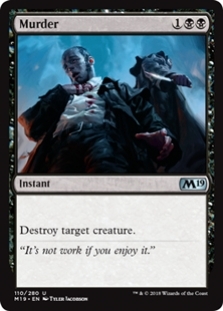 Yeah, that's just a removal spell. 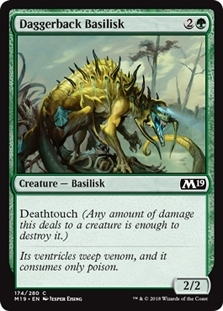 So since this is a weak pack and I'm not missing out on anything exciting, I think it's okay to first pick Death Baron here. Player 4 gets left with the chaps though. 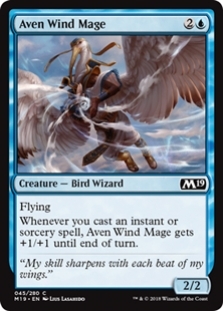 With a first pick Transmogrifying Wand, they have free reign to pick the most powerful card, shying away from aggro when it's close. 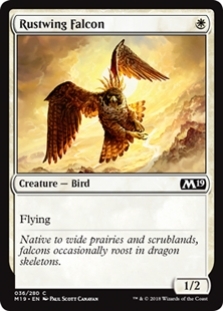 In this pack, only the green cards speak to me. 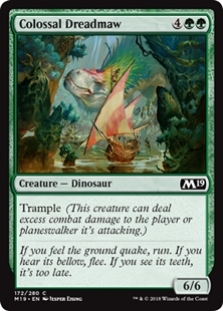 Colossal Dreadmaw is better than it has ever been, as this format often has games come down to the biggest thing on board. 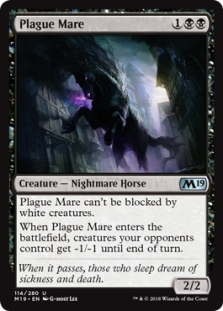 I do think that Centaur Courser edges it out Colossal Dreadmaw, because there is a limit to have many 6-drops you can have in your deck. 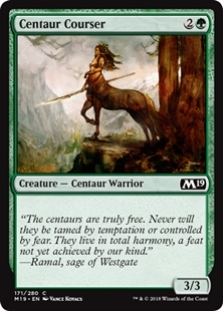 There is no such limit to the amount of Centaur Coursers. 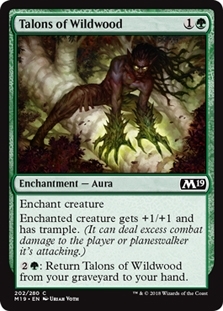 Also, green fits well with Transmogrifying Wand as a color that traditionally lacks removal and does not particularly care about 2/4s. 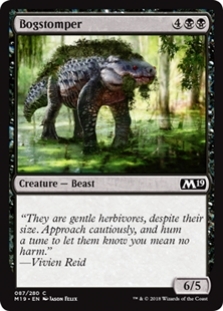 Player 3 already has two green cards, and two early drops that help along your mana, so Colossal Dreadmaw is something they are going to be looking for. Might as well pick it up now out of an unexciting pack. Our black player has another on-color option in Blood Divination here. 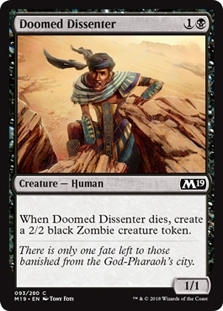 If you can pick up Doomed Dissenters, it gets very close to 4 mana draw 3, which is a powerful card, especially to go with the removal spells already picked. It's not exciting, but since they can stay on color without giving up much, I think they should do that. As for Player 1, there isn't much left in this pack. The three red cards could be a consideration, as all of them are about the same power level and good in different versions of red. 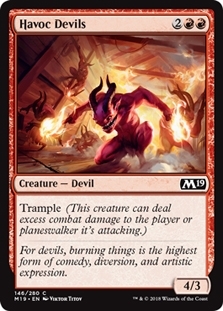 In Red-Green I like Tormenting Voice the best, as the deck could use some extra help with consistency. 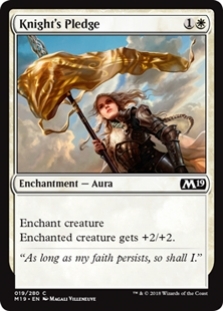 But they also just picked up a semi-late Star-Crowned Stag last pick, and Green-White Auras is certainly a viable archetype. In this deck, it's alpha omega that you pick up many auras like Knight's Pledge and Oakenform. 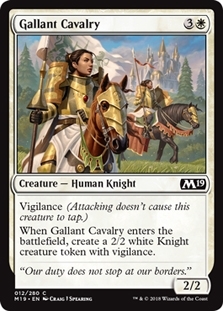 I think that since this could be a likely approach, and the red cards aren't worth much, I'd just hedge towards Green-White Auras and pick a 5th pick Knights Pledge. Not proud of it. 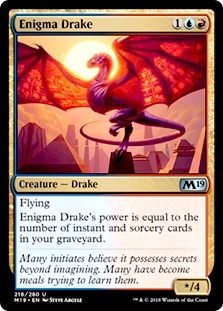 Usually, you want to get those on the wheel, but if they do end up in Auras, they'd be bummed out to not have that Knight's Pledge, whereas red-green don't particularly care about any of these cards. I like to do these draft simulator exercises. If you do too, you can add three more packs and finish out the table. How will the black and green cluster and up? If you want to go all in you can simulate the entire draft. I think this is fun to do from time to time, and it can give you an overview of draft procedures and insight into the effects of signaling, forcing and cutting.